Quick Study: Maria Galina is a prose writer, poet, literary translator, and literary critic who incorporates strong elements of fantasy and myth into her writings. The Galina File: Maria Galina made her debut as a published fiction writer in the late nineties, as Maxim Golitsyn, with the novel A Time of Losers, and her first poems appeared in national publications in 2000. 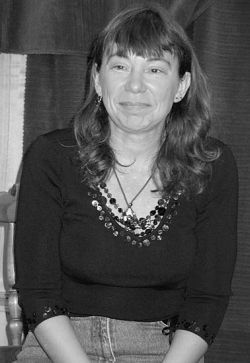 Galina has gone on to publish, first as Golitsyn then as Galina, several other novels, including Little Boondock and Mole-Crickets, both of which were shortlisted for the Big Book Award, in 2009 and 2012 respectively. Mole-Crickets won second prize in Big Book’s reader voting as well as several prizes for science fiction and fantasy writing. Galina has received prizes for her poetry, too, including the Moscow Count award. Galina is also a literary critic who serves as deputy head of the literary criticism department of the prestigious “thick” literary journal Novyi mir, for which she writes a regular column about fantasy and futurology. Galina Recommends: In a 2011 interview with Book-Digest.ru, when asked about her ideals as a reader and writer, Galina mentioned several books and writers: Dmitrii Bykov’s Living Souls and authors Dmitry Gromov and Oleg Ladyzhensky (who write together as Henry Lion Oldie), Oleg Divov, Mikhail Uspensky, and Yevgeny Lukin. In that interview and another, she had high praise for paleontologist Kirill Yeskov, who writes “counterversions” of J.R.R. Tolkien’s books that Galina has called provocative, interesting, and intelligent.